The Environmental Working Group has released a petition to Congress in support of organic farming. Only shopping in coops and natural food stores, I forget that organic produce is still not abundantly available throughout the country. 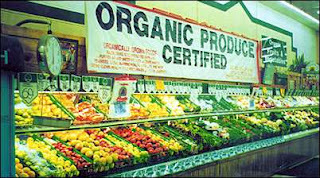 According to EWG, only 3% of fruit, 2% of vegetables, and 0.02% of corn available in grocery stores is organic. *Give organic farmers their fair share of my tax dollars for research on how to grow organic food. * Help more farmers make the transition to organic farming. * Level the playing field for the organic industry by devoting a fair share of resources to organic pest control and crop nourishment. Please sign this petition to give organic farmers a fair chance in the US food market. Since we are talking about food, the Telegraph reported yesterday that “Global Food Abundance No Longer Guaranteed“. Corn inventories in this country have fallen to the lowest levels ever, and we are not alone as global shortages and price increases are occurring. « Green Family Values: Eco Gifts for a Green Father's Day Means Not Buying Anything! This is why I have a farm share through csa and my mom and I grow extra veg in her back yard. Good idea but I just don’t know how many nascar dads will go for it.